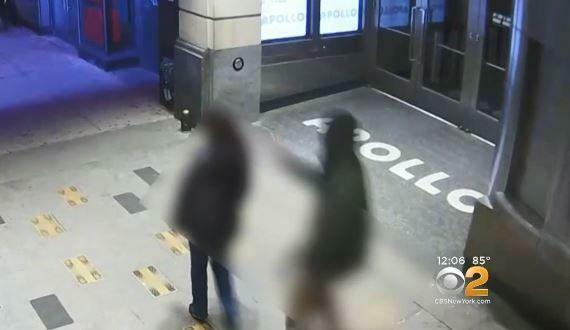 NEW YORK -- Police have released surveillance video of a suspect who they say is wanted for slashing a woman outside Manhattan's Apollo Theater, reports CBS New York. Police said the woman can be seen walking by the suspect past the iconic Harlem theater on Monday night when seconds later, he turns around and slashes her on the right side of her face with a sharp object. Bajram Krasniqi says the 48-year-old victim is his cousin. He saw the newly released surveillance video from police for the first time Wednesday morning. He said the mother of two lost her husband about two years ago and cleans buildings to provide for her family. He said she was going from one cleaning job to another when she was attacked. "She's trying to make a living and another person just go and hit her like that, that's [a] shame," he told the station. The woman was taken to the hospital where she needed seven stitches. Police believe the attack was random and unprovoked. Her family members say she's still at the hospital recovering. "I hope the police are going to catch him, and you know, because it happened to her, it will happen to someone else too," Krasniqi said. Anyone with information is asked to call the NYPD's Crime Stoppers Hotline at 1-800-577-TIPS or visit www.nypdcrimestoppers.com.